Purse is made of cotton fabric adorned with crystals and button embellishment. Small front pocket for holding ID, credit card, or money. Front flap with magnetic snap closure holds phone and pocket contents securely in place. 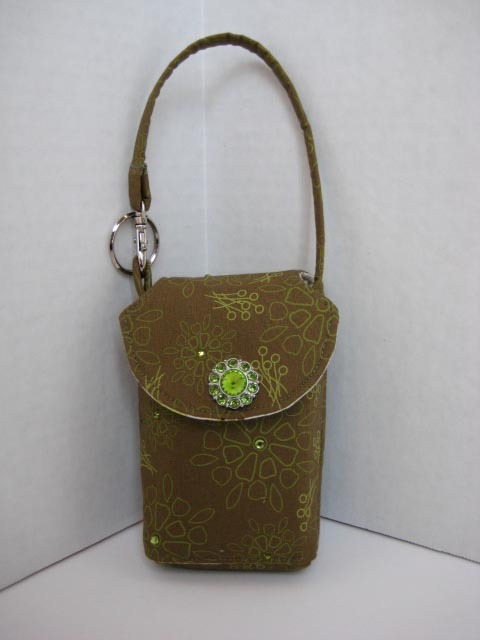 Detachable swivel hook with key ring on handle can be re-attached to your purse or a belt loop. Size approximately 5-1/2"L x 3-3/4" W.
NOTE** Currently, this product style is only available with 45" long strap, for wearing in a cross-body fashion.